Postcard sent by Eugene Guagneli to his mother Luisa Guagneli while she was interned at Kingston Penitentiary. It is a view of the American Falls from Canada. It is possibly spring or summer as there are leaves on the trees that frame the picture plane. There is a small boat in the water, possibly a tour boat full of tourists. There are buildings in the far background. The back of the postcard has writing from Eugene and is stamped with postal stamps from Niagara Falls and one from Internment Camp Operations. Letter correspondence between internees and families went through a censorship procedure. The top right corner shows the outline where a paper stamp was once adhered to. (Handwritten, blue ink, left side) We are all feeling / fine and hope you / are the same. I will / write you a letter / to-night if I have / time as we are having / our examinations now / and its [sic] quite hard. / Best regards from / all and hundreds / of kisses from / Marie + me. Eugene. (Handwritten, blue ink, right side) Mrs. Guagneli / Femal [sic] Internenment / Quarters / Box 22 / Kingston. / Ont. 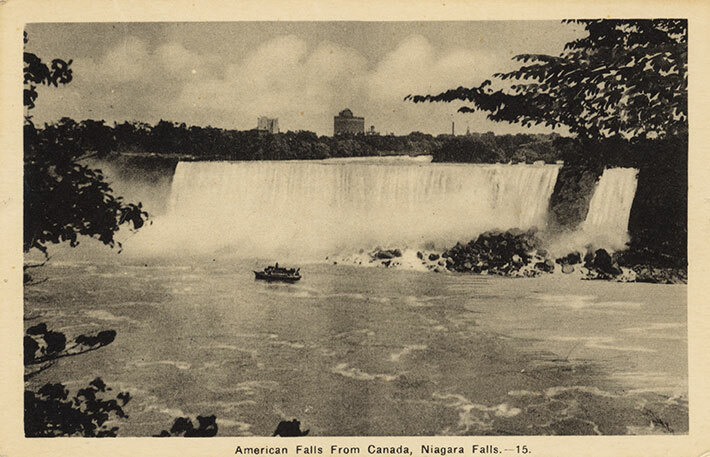 Recto: (Printed, black ink, bottom center) American Falls From Canada, Niagara Falls. ---15.